We have SPRING FEVER here at Marley Lilly!! What's a better way to dream of warmer weather, Lilly dresses and beach trips than giving away FIVE of our new monogrammed tank tops? With all of the colors and styles available, we have a tank that will fit everyone's personality! 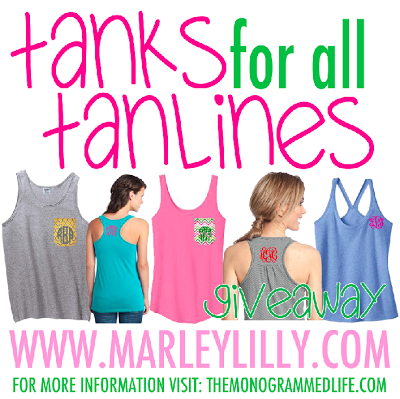 We think that any of our tanks for all tanlines would look great for your new spring wardrobe! We are giving away a Boyfriend Pocket Tank, a Racerback Tank Top, a Girlfriend Pocket Tank, a Heathered Summer Tank Top & a Seersucker Stripe Tank top this week! Read below for more information about each tank as well as giveaway entry rules! Here's to dreaming of warmer weather!! Monogrammed pocket tank tops are a great summer accessory! We are calling this tank the boyfriend pocket tank because it is a unisex cut tank. It looks great layered! Your undershirt or sports bra will show on the sides since the arm holes are larger. The pocket is monogrammed, but the pocket will not be usable. Since this is a unisex style shirt, we suggest ordering the size you would normally wear in a t-shirt. If you would normally get a medium t-shirt, order a medium in this one! We have to sew is partially shut so to make the pocket lay properly on the shirt. It is made of 6-ounce, 100% cotton. Monogrammed tank tops are the best summer accessory! This racerback style tank top looks great with gym shorts or your favorite print! We love this tank because it is long, and stretchy! This tank top is a junior fit, so we suggest ordering 1 size up from your normal size. If you normally wear a medium in a tank, order a large unless you want it to fit tight. We like the more flowy look, but if you are going for a tight fit, then you may not need to order a size up. It is made of lightweight 3.5-ounce, 60/40 cotton/poly. The monogram is placed on the back middle of the tank! 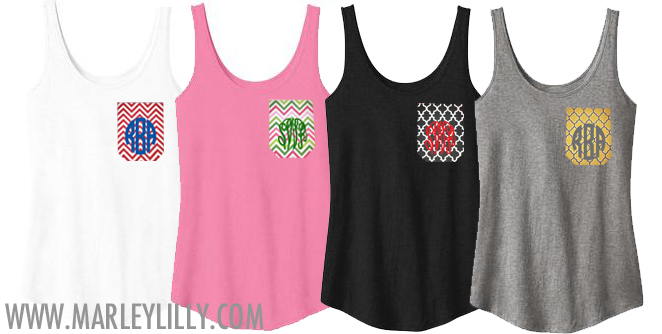 Monogrammed pocket tank tops are a great summer accessory! This tank top is a junior fit, so we suggest ordering 1 size up from your normal size. We are calling this tank the girlfriend pocket tank because it is cut for a woman. It has thinner straps than the boyfriend tank and has a scoop style bottom. It looks great layered! The pocket is monogrammed, but the pocket will not be usable. We have to sew is partially shut so to make the pocket lay properly on the shirt. If you normally wear a medium in a tank, order a large unless you want it to fit tight. We like the more flowy look, but if you are going for a tight fit, then you may not need to order a size up. It is made of soft 3.8-ounce, 100% ring spun combed cotton. Monogrammed tank tops are the best summer accessory! This great tri-blend tank top is super comfy! We love this tank because it is long, and stretchy! This tank top is a junior fit, so we suggest ordering 1 size up from your normal size. If you normally wear a medium in a tank, order a large unless you want it to fit tight. We like the more flowy look, but if you are going for a tight fit, then you may not need to order a size up. It is made of lightweight 4.4-ounce, 50/38/12 poly/ring spun cotton/rayon. The monogram is placed on the front corner of this tank! Monogrammed tank tops are the best summer accessory! This great tri-blend tank top is super comfy! We love this tank because it is long, and stretchy! It is striped and looks super cute with white shorts. This tank top is a junior fit, so we suggest ordering 1 size up from your normal size. If you normally wear a medium in a tank, order a large unless you want it to fit tight. We like the more flowy look, but if you are going for a tight fit, then you may not need to order a size up. It is made of lightweight 4-ounce, 100% ring spun combed cotton yarn dye. 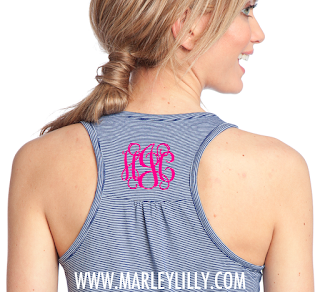 The monogram is placed on the back of this tank! 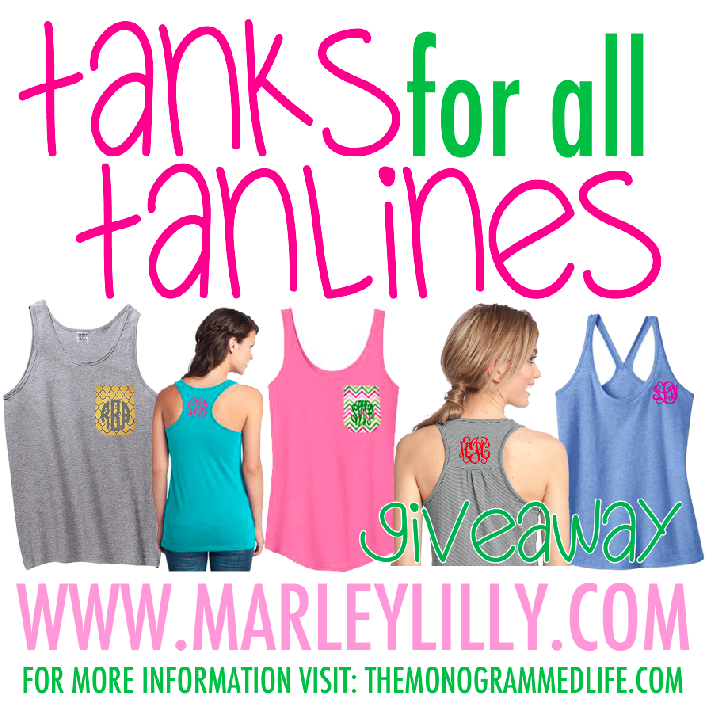 Enter to win a free monogrammed tank top from Marley Lilly! It's as easy as 1, 2, 3! Enter the Giveaway using the Rafflecopter Widget below. Comments on this post with your e-mail address. Contest ENDS Sunday, Janurary 20th at MIDNIGHT. We will randomly select 5 WINNERS and announce them on Monday, January 21st, 2013 at 11AM EST! We will e-mail the winners on Monday, so be sure to check your e-mail! my email is saraharmstrong29@gmail.com! I LOVE MARLEY LILLY!! I adore the new tanks! my email is ryann.kroske@gmail.com ! Love these tanks! Perfect for Spring Break. alglatz@gmail.com - love it all! Thanks for the giveaway! I'm a self-proclaimed monogram-aholic! My email is sweetiechik06@yahoo.com. Thanks! Those are all too cute! My email is williamson.caitlin@gmail.com and I just have to say that I LOVE your products! I hope I win! Love love love the tanks!!! So stinking adorable! I need some cute tanks to work out in! These are so super adorable! I would love to show this off all over my USC campus! Can't wait to get my rain jacket and hopefully a tank from you guys! Thanks ladies! So excited to rock these this summer! Marley Lilly is always being talked up by me, my favorite store! Ordered one & hoping for more! Keep up the great work! Love Love Love these tanks! bwmarie@hotmail.com. love Marley Lilly! I've had my eye on these tanks ever since they came out. maj7@clemson.edu! LOVE THESE. I'm known in my graduate school program for being the only one with everything monogrammed... help me live that up! Love Love Love all things Marley Lilly!! My email is truesdale.jacqueline@yahoo.com Love and obsess over Marley Lilly! Its my happy place online! My e-mail is schelmet@mc.edu and I am in LOVE with everything Marley Lilly! sheltonhe@hendrix.edu college freshie needs some tanks! odonneke@lemoyne.edu Your ladies' products and customer service are fantastic and you helped spark my obsession with monograms! I would absolutely LOVE to add one of these tanks to my monogram collection!!! classygirlingreen@gmail.com, I absolutely love these tanks! I recently found your blog and love all of the products you post about! all these tanks are adorable!! 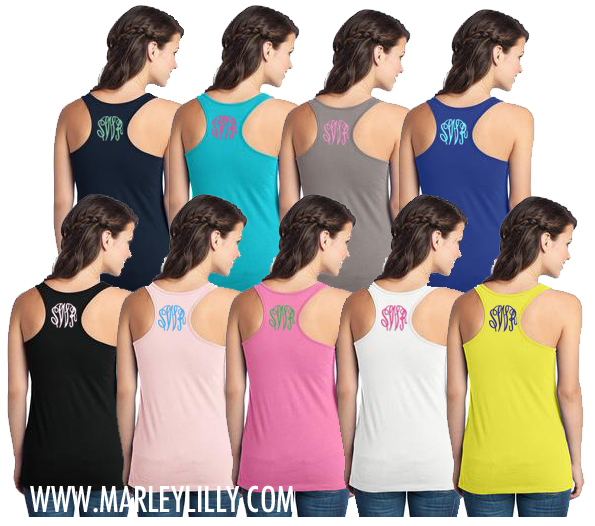 I absolutely love the monogramed racerback tank!! What a cute summer tank!!! These would be perfect honeymoon wear with my new monogram! You always have cute things! Yay! I love the new tanks! I plan on buying 9 for a bachelorette party weekend so winning one would be awesome! I would love to win the blue seersucker! my email is rebeccakeane13@yahoo.com !!! I am obsessed with the seersucker! Monogram and a tank = perfection. These would make the perfect easy summer outfit. Pick me! !